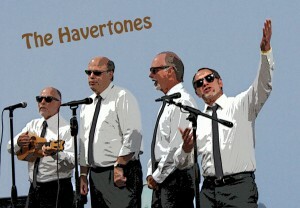 The Havertones have been singing together on and off, in various configurations, for about 7 or 8 years in various configurations; their current singers have been together for two years or so. Their first performance was at the dedication of LLanerch Crossing Park (where the mural is at Darby Road and Route 3). Since then they have performed at township Heritage Festivals, Haverford Music Festival, Haverford Township Day, two nights at Citizen’s Bank Park singing the National Anthem for the Phillies and several other venues in the area. Their general fare includes mostly Barbershop and Doo Wop. The Havertones are led by Sam Angell, and also include Jay Jenkins, Chris Angell and Derek Pretz. You’d never guess it, but they are all from Havertown!